Golden Fried Prawns recipe by Nazia Nazar at PakiRecipes.com. Prawns king size 8 nos. White flour (maida ) 50 gms. Clean, peel and devein the prawns keeping the tail intact. In a bowl mix salt , black pepper and marinate the prawns in this mixture for 20 minutes. Take a bowl and add cornflour, white flour , egg whites, ajinomoto, baking powder, white pepper, water and oil and whip till the mixture thickens and is smooth coating consistency. 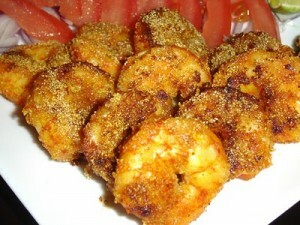 Dip each prawn in this mixture and fry till golden brown. Serve hot with a sweet and sour sauce. Wine > we can't use wine because we are muslims and how could i add this WINE in food ?